If you’re looking to make the leap to a non-toxic home, it can be quite overwhelming. I’ve been there myself. I’ve switched between conventional products, to natural, then back to conventional. Before doing this overhaul, about 50% of my cleaning products were natural, and the other half were conventional. I hadn’t made the full switch because I hadn’t found products that worked well enough for me. But, more recently, I’ve become diligent in moving towards using all natural and non-toxic cleaning products. I knew it would be an investment with time and money. I have concerns of what’s in a lot on conventional cleaners, and even though I’ve used all natural products on my girls since they were babies, I’ve finally made the choice that I want to treat my own body with as much concern. I’m careful with what I eat, and I know its just as important to be mindful of what’s going onto my body as well. Cleaning products touch our skin, as well as makeup and personal care products (which will be Part 2 of this series). There are tons of products out there, and nobody wants to waste time and money buying products that don’t work. Another challenge is choosing the right products. Some claim to be natural, but upon further investigation, they have questionable ingredients. I based this list on how well they performed, my knowledge of natural health products and ingredients, and also how the ingredients rated with EWG (Environmental Working Group). Since the EWG doesn’t list all brands on the market, I would cross reference ingredients one-by-one as most of the individual ingredients were available on EWG. Time consuming, but worth it. I’m also in Canada and most of the EWG products are brands found in the US. So I did have to do quite a bit of cross referencing. Its important to note, if you’ve ever looked at ratings on EWG you’ll know that it can be a bit confusing. Some products get a poor rating because they could be cancer causing or cause reproductive issues. To me, that is a primary concern. Other times, products can get a poor rating based on the ingredients being irritating. To me, this was a secondary concern. Also, the topic of fragrance is a whole other issue. Typically, fragrance is painted with a broad brush in being bad, because nobody knows what’s in the fragrances. I chose to use products that use only essential oils to add a scent to their products. It takes a bit of getting used to if you’re used to using products with a distinct smell. Disclaimer: These are unbiased reviews and my own opinion. There are no affiliate links in this post and I was not compensated to mention any of them. 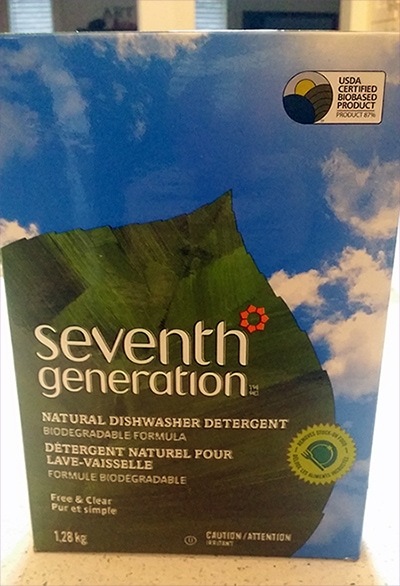 I like how this dishwasher detergent performs, and its not that much more expensive than traditional dishwasher detergent. With the brand of dishwasher we have, its recommended to use powdered vs. the packs. I also decided not to venture making my own, as I’ve read it can be tricky and I definitely didn’t want a dishwasher full of dishes I’d have to scrub a film off of. This one is also environmentally friendly and has no fragrance. Not all dishwashers even need a rinse agent, but I find mine does. Honestly I’m not the happiest with our current Samsung dishwasher. Anyway, I find when I don’t use a rinse agent, my dishes are super wet after a cycle. Using an agent helps. This rinse agent performs very close to the conventional one I was using previously and there are no toxins in it. A bottle will last a while and the price is reasonable too! The price is also reasonable (about $5.00 a bottle). What I do notice, is that I tend to use more then I would conventional dishwashing liquid. That might be because I’m used to seeing more suds. It cuts grease really well. I do find that when its left in a sink full of water it loses suds quickly, so I like it better for jobs where I’m scrubbing dishes with a brush or cloth. I did attempt to make my own dishwashing liquid using this recipe. It seemed to turn out great, until it totally went solid a day later. I remade it adding less washing soda, but still got the same result, just to a lesser degree. I just wasn’t happy with the consistency. I added water as recommended in the recipe but it still didn’t helped. I will say though, that it performed well, but I threw in the towel, as I had such a hard time getting it out of the bottle. On the left was just after I made it, and on the right is what happened to it after 1 day. A girlfriend of mine raves about this detergent and has used it since her kids were in cloth diapers. I figured if it can take poop off diapers, it can clean our clothes just fine…and it does! Actually, it cleans them really well. I don’t think my clothes are getting any less clean than with conventional laundry detergent. I only use 2 scoops in a super sized load. Regular loads you’ll only need 1 scoop. I decided to take the plunge and buy the gigantic container as its the best deal. Its $99 and this is going to last us years! My girlfriend said it took her a few years to go through hers. I ordered mine of Costco.ca and it included shipping. This stair remover works well and has worked great on grass and mud stains. The toughest test was a 2 week old coffee spill that my husband had on his shirt. I knew that wasn’t coming out, but I still tried using the stain remover and letting it set. It got out 90% of the stain so I was really impressed with that! Especially on such a difficult stain. I think if I try it again and let it sit a bit longer it might just come out completely. I’ve also used OxyClean in the past, the powdered one, and that works well too. I got this brand to try out as a sample. Its meant to be an all-in-one cleaning solution and should be used for all your cleaning needs in different concentrations. The white bottle is the concentrate, and the green bottle is what you mix it in. Since the all-purpose spray is what I use a lot in the kitchen especially, I used 1 part concentrate 5 parts water. That makes their recommended all purpose solution. I tried Branch Basics in different concentrations on everything including on glass, on floors and on the toilet/sinks. To be honest, I just like it as an all purpose cleaner. I wasn’t super impressed with how it worked in other applications as I got streaks on my floors and windows. Maybe I wasn’t getting the concentration right even though I did it according to the directions, but I don’t have the patience to keep trying. I’m not a fan of guesswork. One thing I did notice it worked great on is small carpet stains and pet stains on our rug. I sprayed on the all purpose concentration and it came right up. It even worked on dog vomit. If you’ve had a dog you’ll know that it isn’t always the easiest thing to get out of a shag rug! So I’ve pretty much gone through all the concentrate using it as an all purpose cleaner for kitchen and bathroom counters. I spray down my kitchen counters once a day at least, so I go through it fairly fast. 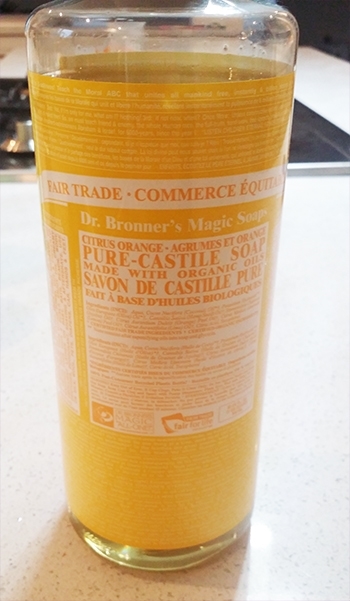 Once my Branch Basics concentrate is done, I’m going to try my own all-purpose spray using Dr. Bronner’s Castile Soap, water and borax. Apparently its a no-no to mix castile soap and vinegar. I’ll let you know how that turns out and how it compares to the Branch Basics. I’ve used a DIY floor cleaner for almost 3 years now on my laminate (wood) floors and tile, and it works fantastic! Its so cheap and easy to make! Its just 1 part white vinegar, 1 part water, 1 part rubbing alcohol (isopropyl alcohol) and a few drops essential oil if desired if you don’t like the smell of vinegar. I don’t mind it personally. When I mop, I also use a Norwex mop with the microfiber pad. I know technically you can use the Norwex products with just water, but I like to use some sort of cleaner as I feel it doesn’t get as clean otherwise. I mix up the floor spray in a bottle like this and just spray the floors and go over them with the damp mop pad. It does a great job, get off all the grime, and dries very quickly with no streaks thanks to the alcohol. I’m not sure if this is recommended on real hardwood floors, so I would test a spot before doing you’re entire floor. I’ve yet to find a store bought glass cleaner with non-toxic ingredients. I’ve been using a DIY version and while it takes more more elbow grease than conventional glass cleaner, it still does the job! Its just vinegar, filtered water and a few drops of essential oil if you don’t like the vinegar smell. I got the recipe from Wellness Mama so go to her site for the recipe. I just add the solution to a spray bottle. I mist my windows and mirrors and wipe with paper towel or a microfiber cloth. The difference with conventional glass cleaner is with that you’d spray, wipe once, and its done. With using the natural solution, you spray, wipe once, then wipe again to get it completely dry and streak free. While it does take a little bit of extra time, its nice not inhaling the strong smell of ammonia and other chemicals. Important To Note : I don’t believe that vinegar is good for everything. If you make some DIY cleaners you’ll know that vinegar is in just about everything. But I don’t believe its good for everything. I don’t find it effective for cleaning heavy grime, grease, and I don’t think its the best disinfectant. So I just wanted to put that out there, since I don’t believe its a miracle cleaner. I think its a great addition to other natural cleaners. I’ve actually been pretty impressed with how effective borax has been. As I mentioned about vinegar not being the all-in-one cleaner, neither is borax. But I do find it to be a great sink, toilet and tub cleaner. It leaves my kitchen stainless steel sink sparkling and same goes for my bathroom tub, sink and toilet. I just sprinkle some in (its a powder), scrub with a brush and rinse with hot water. I’ve also used borax as a laundry booster in loads I felt were extra dirty (like after-camping clothes covered in campfire smoke smell), and its worked great. Its super cheap, a whole box was like $5.50 at Walmart and it will last a long time. I’m not stuck on any particular brand of essential oils as there are so many great ones out there, and many are organic. I just went to my local health food store and picked up a few of my favorite scents. You can use a diffuser, or even use a ceramic warmer. I use my old Scentsy warmers, and add 15-20 drops. Once it warms up the oils dissipate into the air. I also have an aromatherapy nebulizer that I really like from Saje and you add in the essential oil to water and it releases a nice mist into the air. So there’s my list of non-toxic natural cleaning products! I hope these help you in your journey to greener living! Part 2 of this series will be my list of non-toxic and natural skincare, makeup and hair care products. *PLEASE* Share in the comments what your favorite natural cleaning products are. BUT, I ask kindly that you don’t use the comments section to “plug your business”. Please and thanks! Vinegar releases acetic acid into the air. From the Occupational Health Guideline for Acetic Acid: “Acetic acid vapors cause irritation of the eyes, nose, throat, and lungs. Inhalation of concentrated vapors may cause serious damage to the lining of the nose, throat and lungs. Delayed breathing difficulties can occur.” This is especially important information to know if you have a baby or young children, are elderly, or someone in the household that has asthma, bronchitis, or chronic illness etc. as they are more vulnerable to this irritant. In addition if a lot of vinegar is used for cleaning and there is not proper ventilation, over time the acetic acid will corrode soft metals like copper and brass and can cause problems with the HVAC system as the acetic acid passes through the air ducts. But for vinegar and water users, not to fret! This is a much better alternative than most “green” cleaners. The caveat comes down to how you use it. If vinegar is used, it’s best to ventilate and avoid enclosed spaces as the fumes can build up and potentially irritate lungs, especially those of the little ones and immune compromised. I use legacy of clean. Soon to be 3 little ones running around, so I want my home chemical free and clean! I haven’t heard of that one. I will check it out! Thanks!